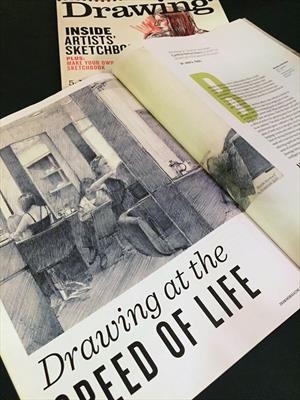 Drawing magazine in the USA published an eight-page feature article on my location drawings in their Summer 2016 special issue on sketchbooks. The article was proposed and written by the British painter John A Parks, a faculty member of the School of Visual Arts in New York. The drawings selected to illustrate the article were made on location in Windsor, Venice, London and Kansas City. Drawing magazine is part of F+W Media, Inc. The FW community includes Artist's Network and North Light Shop.